If you’re a low carber you might already know that the sliced bread in the infamous saying? I think I go unchallenged in saying that’s sugar free Jelly Powder / Jelly Crystals for us. Jelly turns everything into a sweet delicious pudding without the need for carbs nor a high calorie level which is usual with our high fats foods. Basically, it’s the holy grail to tame any sweet tooth without consequences on our diet plans and lifestyle. Amazing right? 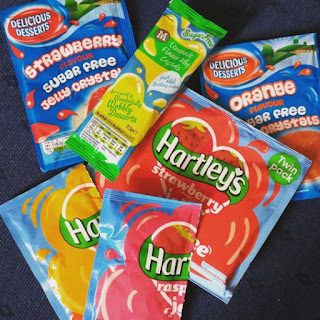 A few weeks ago (this actually happened in 2015) I had a discussion with Hartley’s though as they changed the labels on their Sugar Free Jelly Crystals Sachets and basically implemented the sneaky food label rule which says that “If a serving contains less than 0.5g of a nutrient, that nutrient’s value can just be declared as ” providing now only nutritional values for the jelly powder if “prepared” following the instructions, which, would consider only making jelly pots, and 4 out of a sachets. Us low carbers are much more creative than that! The previous labelling had both values “per 100g as sold” and “per 140ml prepared” which basically meant ¼ of a sachet. The values per 100g sold of course allowed us to work around how much carbs were in a sachet and therefore how many carbs had our portions independently from how we decided to include the jelly powder in our recipes. Hartley’s customer service was really nice and keen though, and they went the distance by giving me a call to explain the changes were due to the fact the previous labelling was considered “confusing” by some customers. Namely they received many enquiries stating “how can it be sugar free if it has 17g carbohydrates per 100g?”. I know, I know, not everybody is as well trained reading labels as we are, and so, after a while Hartley’s tried to explain that every sachet contains 11.5g of powder (1.7g carbs) and that still needs to be split into portions. ingredients: Pork Gelatine, Acid: Adipic Acid, Flavourings, Acidity Regulator: Trisodium Citrates, Sweeteners: Aspartame, Acesulfame K, Acid: Fumaric Acid, Colours: Copper Chlorophyllin, Mixed Carotenes. This didn't exist when the first edition of this list was done in 2015, but they are now sold at least in Tesco, by single sachet and seem to not have Matodextrin the their ingredients, making it keto-friendly. However, like most they do not show value per 100g as sold but per portion made, which also just generically says less than 0.5g carbs per 140ml portion, so conservatively, count 2g carbs per sachet. Ingredients Vegetable setting agent (E407), Acidifying agents (E330, E332), non-nutritive sweeteners (sodium cyclamate (E952), Aspartame* (E951), sodium saccharine (E954), sodium bicarbonate (E500), Vitamin C (E300), Flavouring (E414, E1520, E300, E200). Food Colouring (E124), Anti - caking agent (E551). *contains phenylalanine. Tartrazine free. Raspberry, Strawberry: declares less than 1g carbs per 140ml portion, so conservatively, count 2g carbs per sachet. On my NO list because they contain Maltodextrin and higher carb values than other available brands . However they still list their values for 100g of product as sold (they used to, not anymore), which earns my respect for the brand’s transparency. Ingredients: Pork Gelatine, Citric Acid, Colours (Beetroot Red, Annatto), Natural Flavourings, Maltodextrin, Acidity Regulator (Sodium Citrates), Gelling Agent (Adipic Acid), Sweetener (Sucralose). Could be a runner up for best jelly in the UK after Hartleys for what concerns Carbs value, but alas, they also use Maltodextrin as a bulking agent for the Strawberry and Raspberry flavours. My local B&M often has the Hartleys double sachets on 3 for £1 which is a total bargain!